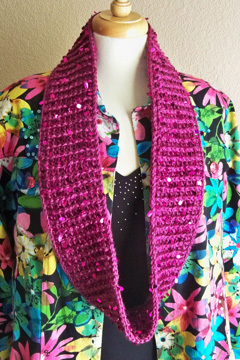 Put a little “glitz” into your life with the Swanky Cowl! It’s made with just one ball of Red Heart Boutique “Swanky” yarn (with oval-shaped sequins), or your favorite worsted weight yarn. This cowl works up quickly so you can wear it or give it in no time! It can be made wider and/or longer, if desired, by using 2 balls of yarn instead of one. The pattern includes full written instructions, as well as photo tutorials for the Front Post double crochet and Back Post double crochet stitches (for both right-handers and left-handers). These stitches give the cowl texture and make it completely reversible!